A form of inflammatory arthritis caused by high levels of uric acid in the blood, gout can be extremely painful and difficult to manage. It manifests when the uric acid forms sharp splinter like crystals within joints. There are numerous phases of gout. Some symptoms of this hard to manage disease include extreme pain in various parts of the body including the joints and ears, severe tenderness, excessive redness, and swelling. Gout is common and is associated with the lack of exercise, genetic disorders or an excessive consumption of protein. It can also be caused by extreme stress. Studies recently show gout can be considered a precursor to other illnesses like heart disease and kidney disorders. It is important to understand how it develops and what are the phases of gout. Hence, we present the stages of gout along with some easy gout remedies that can help with managing the pain with ease anywhere. Asymptomatic hyperuricemia is the first phase of the initial stages of gout. There are no indications or symptoms during the manifestation of this stage. This stage is where uric acid predominantly begins to crystallize around the joints. The body has high levels of uric acid. This level of gout can be managed by implementing some easy gout remedies at home. Drink a couple of spoons of unfiltered apple cider vinegar with a teaspoon of honey and a wedge of lime mixed in water. Apple cider vinegar is highly acidic and helps relieve pain and balances out the high levels of uric acid. Adding a teaspoon of honey helps reduce inflammation as honey acts as a natural anti-inflammatory. Mix this combination in water and add a wedge of lime so your body recovers any electrolytes that it lost and stays hydrated. This is the second stage of gout. It manifests with little to no warning and can be spontaneous as well as painful. These attacks can occur at any time but most commonly hit patients after a night of heavy drinking. This is due to the body’s reaction to alcohol leading to a spiked level of uric acid. The high levels of uric acid can form sharp needle-like crystallization. These instantly cause redness, tender joints, and leads to extreme pain. Spontaneous attacks of gout are mostly not serious and may not lead to second attacks. However, nearly sixty-five percent of patients get a second attack within the first two or three years. This type of gout will lead to excruciating pain for eight to twelve hours but should subside soon after. Manage this phase of gout through some easy gout remedies like eating dark cherries. Cherries contain high amounts of anthocyanin. It is a water-soluble vacuolar pigment that helps counteract the high levels of uric acid in the body. Anthocyanin also acts as a secondary metabolic supplement. This ensures the body maintains a high metabolic rate to help it heal. Cherries are also rich in antioxidants that help in pain management and act as natural anti-inflammatories. This is the interval between gout attacks. Although there is no pain, gout still remains within the patient’s body. The crystallization subsides but the inflammation remains. This is the third stage of gout. During this stage, there is a real chance of damaging some if not a majority of the joints to a severe degree. Combat this level of gout with some easy gout remedies like grating ginger into meals or nibbling on some dry ginger. It acts as a natural anti-inflammatory and aids in pain management as well as reducing uric acid levels due to its many medicinal properties. Ginger root can also be made into a paste and mixed with water or used as a spread in a sandwich or a dip. The fourth and possibly most severe stage of gout is chronic. This means gout attacks become frequent. This stage can occur if uric acid levels within the body remain high for a period of years. 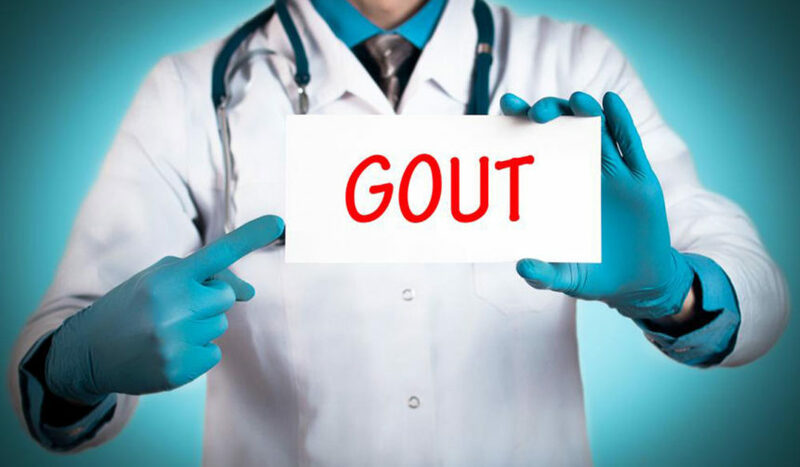 During this phase of gout, there are real chances of damaged limbs, joints, and organs. If gout manifests at this level, loss of mobility is a real possibility. This level of gout can be managed through therapy, pain management, and treatment. The best way to overcome the battle with this severe type of gout is by prevention. Bananas, Epsom salt, baking soda, cold water, lemon juice, grapefruit juice and activated charcoal are some easy gout remedies that can be used to prevent this severe stage. Keeping active and exercising also help increase the body’s metabolic rate and balances the body’s chemicals. Combining exercise with a healthy diet will go a long way towards prevention of any stage of gout. This means limiting the intake of caffeine, sodium, sugar, and alcohol. We recommend using the easy gout remedies mentioned above after consulting a local physician.